Default shortcut for switching layouts is Alt+Space. 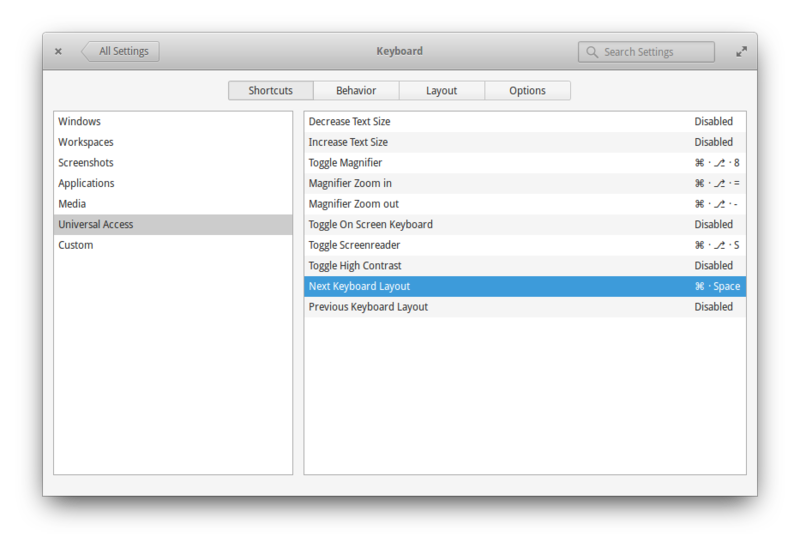 If you’d like to use a different shortcut, you can set one in System Settings -> Keyboard -> Shortcuts -> Universal Access as “Next Keyboard Layout”. However, it is not possible to select shortcut Shift+Alt or Shift+Ctrl. gsettings set org.pantheon.desktop.gala.keybindings switch-input-source "['<Alt>Shift_L', '<Alt>Shift_R', '<Shift>Alt_L', '<Shift>Alt_R']"
gsettings set org.pantheon.desktop.gala.keybindings switch-input-source "['<Ctrl>Shift_L', '<Ctrl>Shift_R', '<Shift>Control_L', '<Shift>Control_R']"
Not the answer you're looking for? Browse other questions tagged release-freya keyboard keyboard-shortcuts or ask your own question. How can I add a keyboard shortcut to launch a program?